Stanford’s most historic tradition, Full Moon on the Quad began as an occasion for well-intentioned seniors to welcome freshmen girls to the Farm. Since then, the event has become a night of body paint, drunk make-out sessions and light-hearted debauchery. Nothing screams Stanford more than a frolic from one pretty fountain to the next. If you don’t manage to fountain hop at least once in your four years here, you don’t receive your degree (just kidding, but come on). 680’s annual clothing-option extravaganza is the only campus-wide party that requires ID certification AND admission stickers, but even then, the only way you’re guaranteed entry is if you live there. Most freshmen’s introduction to the quirky, wonderful place that is Leland Stanford Junior University is Band Run, an event led by the Band. In body paint and rally gear, the Band takes these young upstarts on late night jaunt around campus, ending at the metaphorical center of their Stanford lives: the Quad. A great way to sculpt your quads while taking a study break, hiking the dish makes Stanford kids feel both outdoorsy and athletic. But don’t worry — we doubt you’ll be chased by a mountain lion. Love them or hate them, SAE knows how to throw a raucous party. If you can deal with the sticky floors and questionable smells, it’s a fun way to usher in the new academic year. The only time students are allowed to get funky with the ghouls and ghosts of Stanford’s past at our namesake’s crypt. Creepy, huh? What better way to finish off the school year than with a keg stand in Meyer Library? 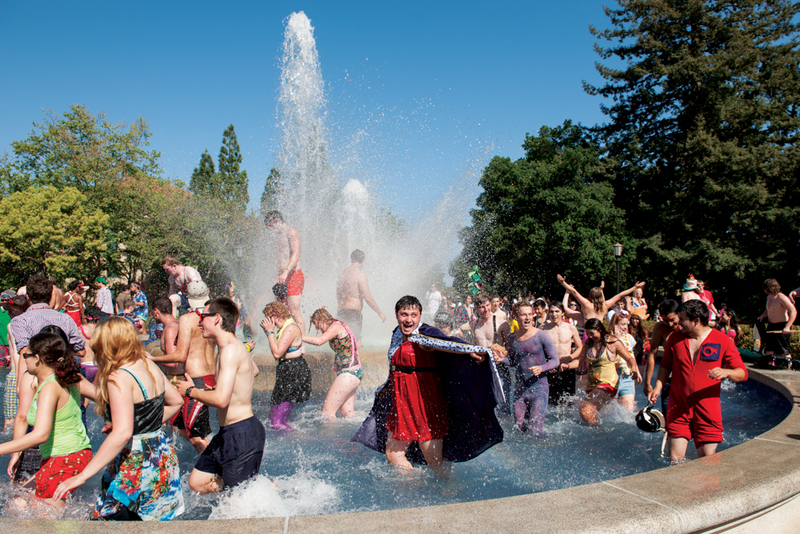 This Stanford staple is essentially a drunk parade across campus — no more, no less. With such tantalizing snacks as chicken strips a-fire, shrimp fried rice and chocolate milkshakes, there’s no finer means of satiating your midnight munchies than Lag’s greasy late night fare. For the more alternative crowd, EBF’s Happy Hour combines the perfect amount of chill conversation and electric music to satisfy even the hippest hipster. Agree or disagree? Tell us in the comments.